Dance.Here.Now. 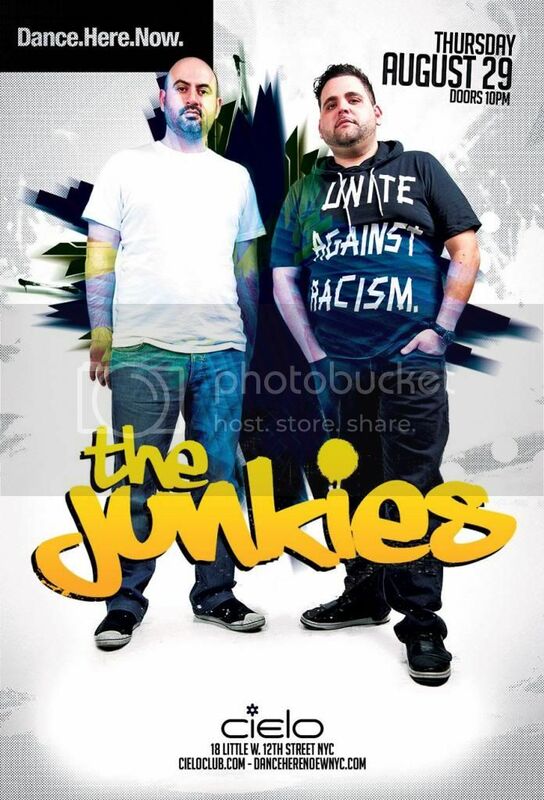 is excited to present The Junkies. The Canadian duo has been a consistent present force in the Toronto club scene for over 10 years. Holding a residency at the legendary Guvernment Nightclub as well as Footwork Bar keeps them educating the electronic faithful on a weekly basis in the undisputed capital of electronic music in Canada. With remixes and production releases on prominent labels such as Rawthentic, Sci-Tec, Mindshake and Monique, these rising star duo are sure to keep us dancing on many dance floors in the future. End your August dancing schedule with a BANG to their evolving sounds ranging from deep soulful house to techno at Cielo on Thursday, August 29th.